I met Johnny while he was studying a Masters degree in the UK in 2012 and was coaching out of Gosling Tennis Academy as a consultant tennis coach. 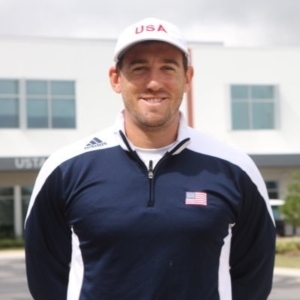 We stayed in touch after he went to the states in 2015 and he now has a fantastic role with the USTA focusing on all facets of Player Development from 10 and Under to the professional game. 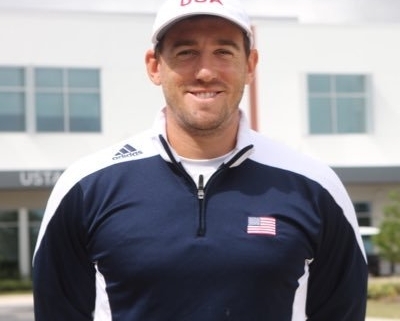 As part of his role Team USA offers support to US juniors through supplemental training opportunities via camps around the country and trainings at the USTA National Campus. Johnny was recently able to attend the GAIN Network, set up by an iconic Strength & Conditioning coach Vern Gambetta. 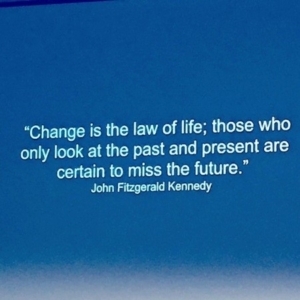 It’s something I have thought about doing before as a great form of professional development and opportunity to connect with the GAIN network. Its $2000 to attend the four days the first time you go and then $900 every time after or $300 to access the network site if you don’t go. Here what Johnny had to say below! 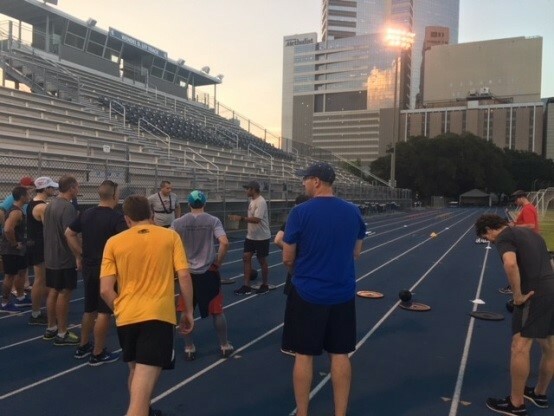 Rice University in Houston Texas was the location of this year’s GAIN Network brought to us by Vern Gambetta, a world renowned athletic development coach. 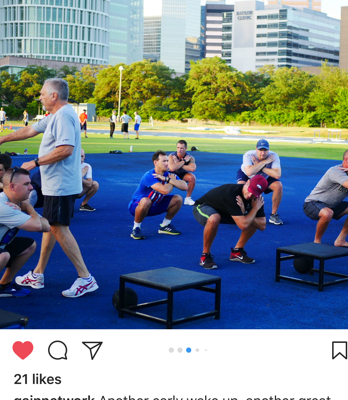 In its 11th year, GAIN brings together Strength and Conditioning/Athletic Development Coaches, sports coaches and sports medicine professionals into one location for high level collaborative professional development. Going into the program I didn’t know what to expect from the packed 4 days. Our Director of Athletic Medicine at the USTA National Campus and good friends with Vern had recommended me for the program. 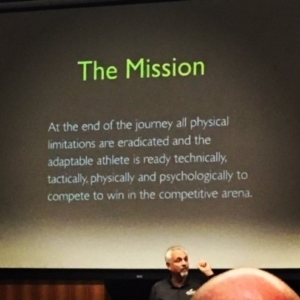 I was excited to dive into an area that I have ingrained as part of my personal philosophy developing tennis players and being exposed to this side of the development spectrum was going to be exciting. The agenda was packed starting off at 6:30am and finishing around 8pm (10pm if you’re counting the interactions with other attendees and faculty staff). So rather than go through every presentation I will take you through some that stood out as it pertained the world I am involved with in tennis. 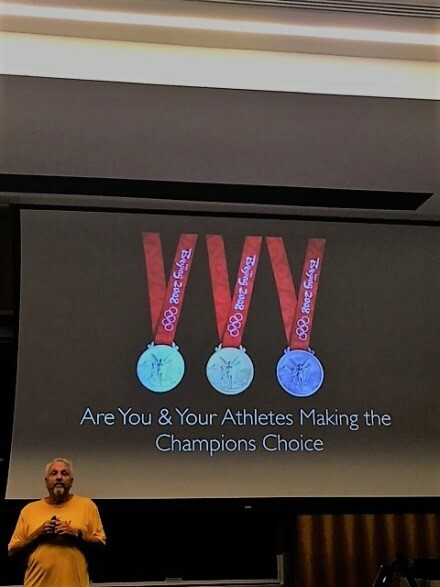 We started Tuesday evening with Coach Gambetta setting up the theme for the week “Connecting the Dots – Getting back to basics”. Networking was the unsung hero of the week, where you got to connect with professionals from all walks of life from all over the world. This in itself is where a lot of the learning and sharing was done over breakfast, lunch and dinner. Each morning started off at 6:30am at the Track and Field facility with “Morning Madness”. This was three 20 minute stations presented by faculty coaches of the GAIN network. 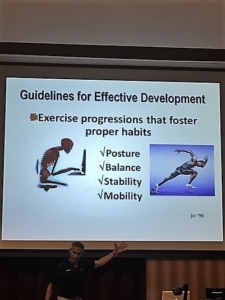 “Educational Gymnastics” – James Marshall from Devon, UK delivered a session on the basics of human movement, rolling, jumping, blancing, which made you feel like an excited 10 year who couldn’t wait to get out of math class to get to PE. “Sticks and straps” by Steve Myrland was a personal favorite due to the shoulder stability/mobility related to overhead athletes. It was fun and collaborative focusing on internal and external resistant exercises using only sticks and straps with push-pull motions in certain stances. Something I will be applying with athletes as it beats the standard band work most tennis players are bored with and perform with poor quality. “Locomotor patterns” and “Reaction based games” by Greg Thompson delivered two purposeful game based warm-ups going through many different movement patterns in teams. It highlighted the FUNdamentals in a fun dynamic environment. Sprint mechanics was emphasized in both class room and on the track. Coach Jim Radcliffe from the University of Oregon presented two sessions he calls “the rehearsal” with his athletes in the “Oregon warm-up” and “Plyo Progressions”. His ability to teach without saying many words and letting you work through the exercise was a great quality, and I took this as a lesson in how to take something complex and the danger of over coaching can exist and simplify it for students. The rest of the morning sessions were rounded up by UK’s Nick Hill and Gold Medal Fiji’s Rugby 7’s coach Naca Cawanibuka on “Robust Running”, Nick Garcia and Dan Noble on dumbbell complexes. Nick also presented his periodization plan with his football athletes, which was well thought out and detailed. I really liked the concepts he presented, but tough to apply in tennis with no real defined seasons especially in the junior world. All morning sessions can be incorporated with tennis athletes especially juniors. The generalized athletic movements are a pre-requisite to reaching the top of the game now and in the futre and must start early in the child’s development, but as I look at how to impact our athletes, the need to be combine this early on with tennis specific movement patterns on the court is essential. The day was then scheduled with two morning presentations followed by lunch. After lunch interactive hands-on workshops broke up the day. These sessions were 1. “The Tensegrity model and how it changes the concept of stretching” emphasized the importance of extension. 2. “Balance and it’s Permutations” with Grace Golden was another favorite of mine as it allowed for creativity in team based environment. 3. A PCA and return to competition assessment took us through some exercises that we can do with our athletes to understand their instabilities and weaknesses which can inhibit their ability to perform certain movement. An example being an athlete has poor dorsiflexion of the ankles, which I see a lot in juniors, could be due to the ankle joint or down to tight calves, but this may affect their ability to squat or to get into a viable ready position with ease, thus then affecting their ability to accelerate. It truly is inter-connected. The workshops were followed by two more presentations and finishing up with more discussion after dinner. In the interest of time, I will go over some of my favorite sessions. 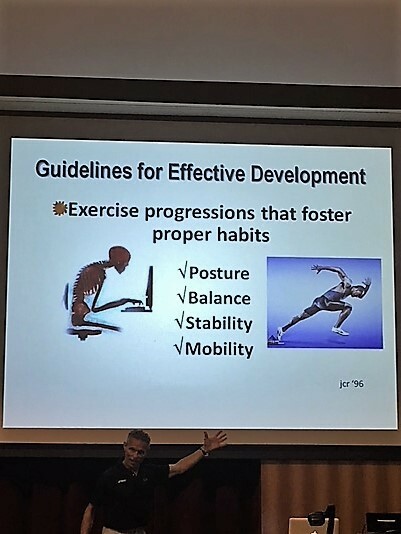 Coach Jim Radcliffe, Strength and Conditioning Coach for the University of Oregon presented two great movement madness sessions as mentioned above, he also delivered two stand-out presentations. One titled “Orientating your compass – Finding True North” brought you back to the essence of coaching which is teaching and educating first, an art that is slowly becoming extinct. 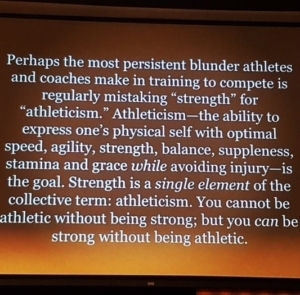 We have to teach the athletes to learn the concepts, not just the drills; this was the presentation that set-up the mindset that is a pre-requisite to becoming a master coach. His second “Robust Running”, centered on the development of running mechanics and technique via the hip in creating movement efficiency negotiating the ground. The piston position was emphasized and demonstrated which followed up with examples of exercises that promote the correct technique and hip mobility and projection. 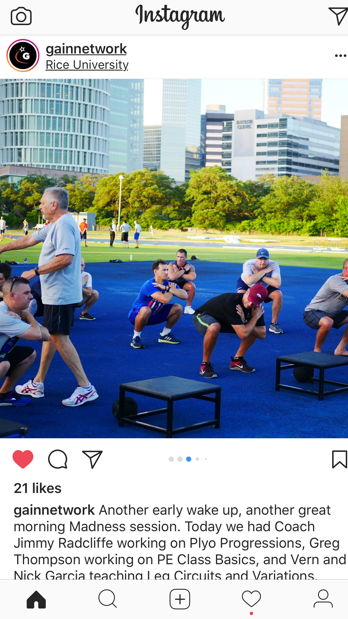 Peter Weyand, a professor at SMU presented on “Science for Speed” creating an understanding that developing speed isn’t based around leg speed it’s based on improving peak ground force reaction and contact using three inputs, 1. Contact time, 2. Aerial time and 3. Ankle motion. Coach Magness stressed the importance of developing the capacity needed for the demands of the sport, develop the awareness that it is about the athlete not the system and it’s about people and not numbers. Another example of getting to the core of being flexible with each athlete understanding that their needs may be different. 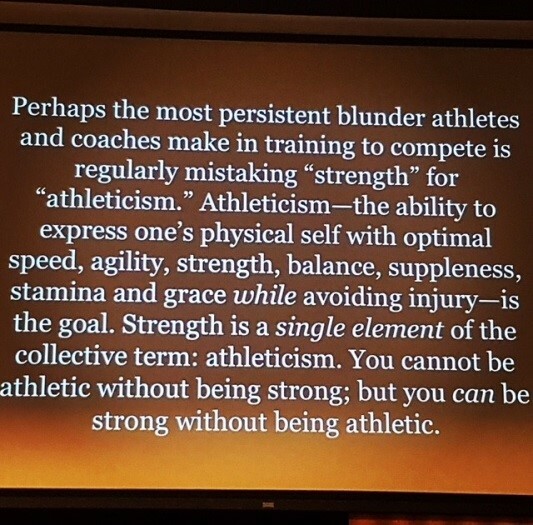 This message particularly hit home being in tennis as you have athletes operating in different energy systems, all at different stages in their development and of course there is game style to take into account. It truly is an art to figure out how to help each individual maximize their bodies so they can compete at the highest level their bodies allow. I was excited by the title of this presentation. The USOC recently came out with their “American Development Model – ADM”, to create a drummed down version of LTAD models that have had 7 stages or 10 pillars or whatever complex system the research has come up with. 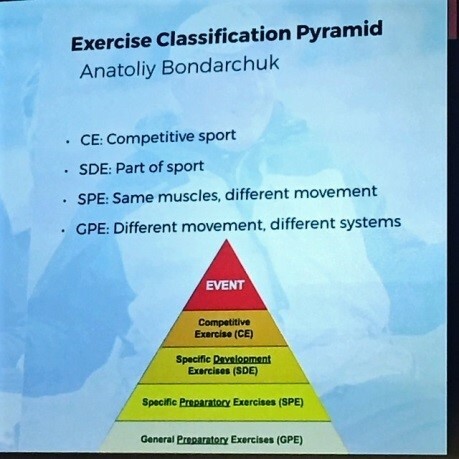 It left me feeling that year maybe the information makes sense but the way its presented makes absolutely no sense to coaches that are actually out there living it each day. 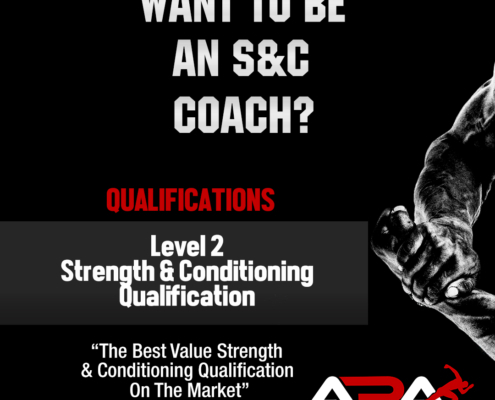 James Marshall whose background with athletes of different sports, NGB’s and now inspiring many kids at his own gym in Devon, UK was very well-versed in this area. He made comparisons to LTAD models and what is actually delivered provided an insight of making sure we don’t get away from what is most important, which is providing opportunities for our children to explore for themselves. LTAD models are too complex fictional and no possible way to execute. I agreed with all of his experiences and observations as he took us into the day in the life of his son, which showed us the many opportunities he had to free play, some facilitated by James, but a lot was through the natural environment. He simply put the question back to us, how do you measure that in your LTAD models? Free play is dying due to cultural factors, government policies with regards to P.E. as well as many factors deter our youth away from daily exploration of what their bodies can do athletically. With Generation Z, the iGen generation coming through, they will be the first generation that is grown up in a technological world. We must find ways to inspire free-play and let kids be kids. I needed the tissues for Dan Noble’s story from the Hill Academy in Canada with a powerful journey through his development as a person and coach. Tragedy and strong cultural values drives an environment to come together to inspire greatness into groups of athletes and human beings. He implements daily journal time, free thinking and reflection, free play, where he showed us a video of his kids coming up with obstacle courses to go through in between classes, stressing the importance that it’s ok to fail. When it all comes down to it, the culture will create the environment, and he has certainly done an amazing job of that. We finished up on a great open discussion on “Integrated Performance Teams and Scope of Practice” stressing the importance of communication across multiple fields which are becoming increasingly segmented due to specialty within specialty fields. 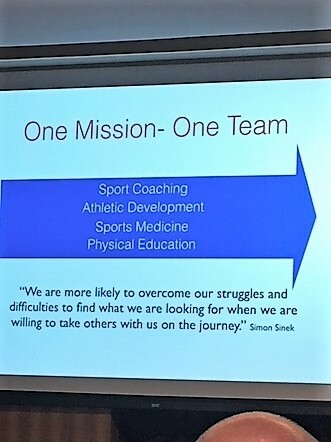 In order to provide and plan in the best interests of the player, the sports coach who leads the athlete, the S and C / Athletic Development Coach / Sports Medicine and Nutrition all need to come together as one. We need to eradicate phrases such as “staying in my lane”, and do whatever it takes in the best interest of the person/athlete. There were many other great presenters that I could talk about. 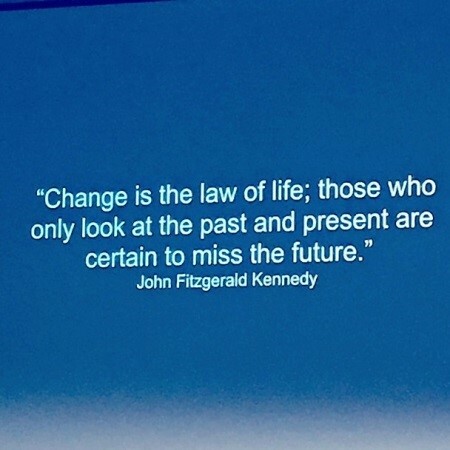 Overall, I was taken back by the level of detail and quality of the presenters and my fellow attendees. The coaches were very knowledgeable, highly experienced individuals. 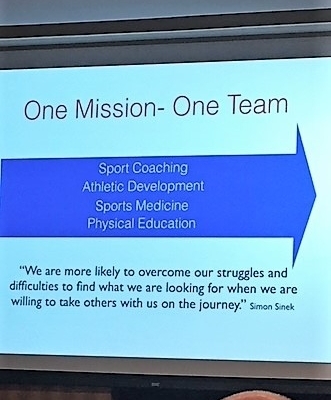 A lot of the learning took place in connecting with other attendees, understanding their sport and challenges and how they overcome those challenges to deliver their programs. I took a lot away as predominantly a tennis coach who has a strong passion for athletic development and the art of movement within our sport. I firmly believe we have to specialize in generalizing but we must also have a very strong grasp on movement patterns and how to be as efficient as possible in those movements within tennis and to be able to do it with grace and ease. This has to be taught, trained and coached from an early age if a tennis playing athlete is going to reach their full potential. The skill as a coach working with the tennis athlete is balancing out the times where we can focus on the overall athleticism with the times we need to specialize with efficient movement patterns. 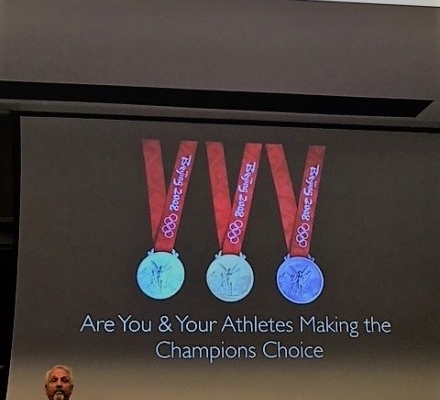 Vern closed us out with “The Champions Choice” posing the question to us as coaches “Do we make the champions choice in our coaching and with our athletes”, do we help the athletes understand and recognize what the champions choice is and what it means? 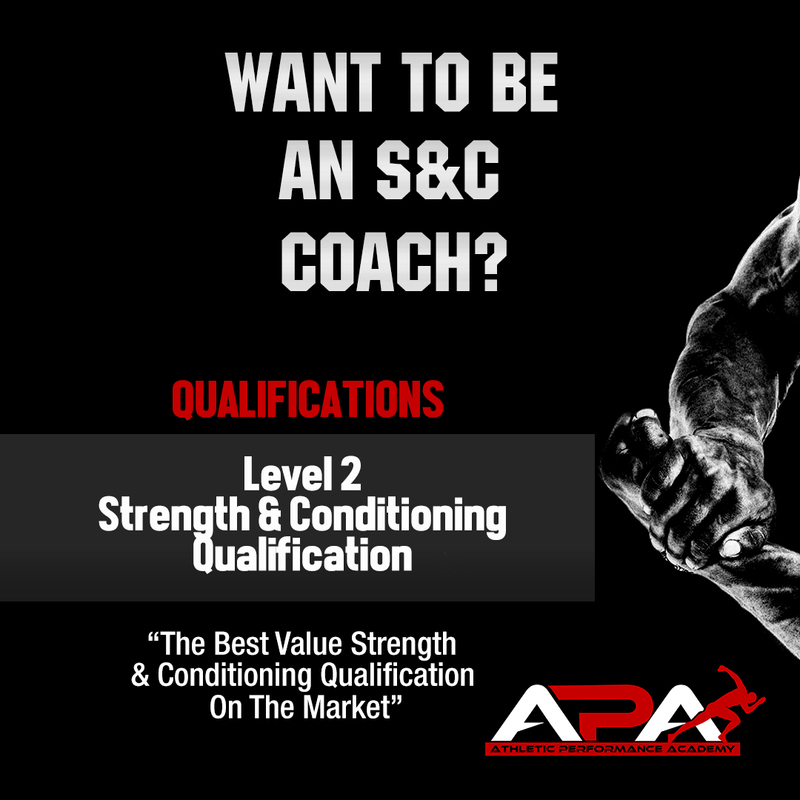 The qualities of a great coach are being able to lead by example but unlock the potential of an athlete by the relationships we build with them and the quality work we put into their development. It was reassuring and enlightening, overwhelming but simple, creative and collaborative. I have no doubt that I would go again year after year for my dose of professional development as Vern continues his quest to COACH THE BEST TO BE BETTER.